Define your priority plus wants. HF, weekends during the day – probably 20 mtr. single band. Or wants would be 20, 15 & maybe 10 mtr. HF, evenings or early mornings would be 40 mtr. Or wants would be 40 & 80 mtr. HF, want it all then go for 10 thru. 80 mtr. Looking for Long distance - out of country; Medium distance - would be to East Coast; or Short distance - surrounding states (400 miles & less). Defined by Freq. & height above the ground. Higher requires stronger pole/tower or guying or combination. Local communications – VHF (majority) or VHF & UHF – Dual band antenna’s. Evaluate your property for three dimensional space with structures like buildings, trees, fences, etc. Another important consideration is covenants (CC&R’s) which puts restrictions on what type of antennas can be installed. You should read them first & determine your restrictions. Typically, this means antennas must be stealth or within the roof of the house or in the addict. Stealth could mean an American Flag Pole that doubles as an antenna. Other stealth things could be a wire antenna that is attached to trees or does not require free standing structures to hold it up. Some verticals can be telescoped up at night & lowered during the day. Antennas such as short dipoles, small loops, or hex beams can be mounted within the roof of your house. Dipoles-HF, longest dimension of property is important for 80 meter dipole (over 120 feet or shortest 80 feet with reduced performance). Also height is important, especially for long distance signals. Less height is required for higher Freq. bands like 10 mtr (about 15 ft.). Try for 1/2 wave length above grd. or one quarter wave length above grd. Verticals-HF, needs area of 360 degrees for radials. Radial wire for 80 mtrs needs to be 66 plus feet long. Shorter for higher bands like 10 mtrs or about 9 feet (1/4 wavelength). A typical multiband 10 thru. 80 meter vertical is 43 feet high. Minimum four radials per band makes the efficiency of the system at about 20 percent which will work good. The appropriate number of radials is about 12-16 per band and less for multi-band verticals because some of the low HF band radials will work for the higher band HF frequencies. Note the ends of the radials can be curved like an (“L”) to accommodate space limitations. Yagi antennas are typically for 20 thru 10 mtr and require a structure to hold them up (tower & a rotator). This drives cost many times over the cost of a vertical or a dipole. 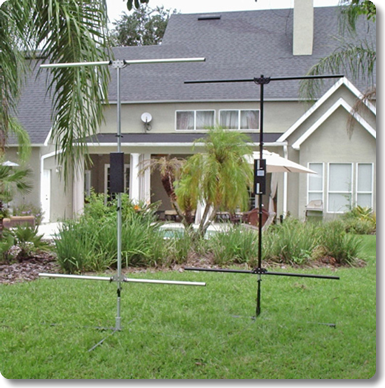 Yagi’s are directional & will provide long distances with less power & less QRM. The height for yagi’s is the same for dipoles. Try for one half wave length high. A suggestion would be to Develop your wants & needs & take measurements of your property & the structures on it, with pictures. Then get Elmers from the club to walk the property & make suggestions based on your needs, property configuration & available funds. VHF & UHF antennas are typically small enough that they can be mounted almost anywhere without generating visible ques. Otherwise they can be mounted on or in the house. 10 thru. 80 mtr dipoles cost about 50 to 300 dollars & about 100 dollars for a thirty foot pole – guyed. 10 thru. 80 mtr 43 foot verticals cost about 300 to 600 dollars with radials & a balun and/or matching network. 10 thru. 40 mtr 28 foot verticals with a counter-poise are about 300 to 700 plus dollars. Mono-band verticals are about 170 to 250 dollars. Hex Beam (2 ele.) 6-20 meters about 700 dollars. 3 ele. plus Yagi 10-20 meters full size about 600 to 5 thousand dollars. Towers cost about 2 – 50 thousand dollars plus installation. Home Brews can reduce costs significantly. People have attached their twin lead to aluminum rain gutters, pieces of pipe, etc and made them work. Note – Non-typical antennas require a high capacity matching network or antenna tuner. None of the perspectives above include coax. Good coax is about $1 per foot. Always check for power lines before erecting or putting up an antenna. Remember, antennas can sway in the wind, so place your antenna as far away as you can from power lines. Do not put an antenna next to the children’s bed room with more than qrp RF power & operating for long periods. Get a perspective of RF exposure to your family and your neighbors (property line, i.e. public access). FCC RF – Exposure Regulations – The Station Evaluation – http://www.arrl.org/fcc-rf-exposure-regulations-the-station-evaluation This will provide instructions on how to cook book your evaluation. Always use the longest & tallest & highest above the ground antenna, as you can! This maximizes the efficiency & is easier to tune. Many short (for a band or frequency) antenna’s require manual manipulation to use more than 25 khz of a band width or to change bands. Others have remote control to tune the movement in frequency or bands. Always use the best coax you can afford. For example – on 10 meters, RG-58 has more than twice the loss of signal as LMR400 does per 100 feet (sending & receiving). First - Always tune the antenna as close to 50 ohms for the frequency you will be using. At 25 ohms and above or 100 ohms and below will work – 2 to 1 SWR. Always check the SWR with low pwr (5 watts) and if necessary use an antenna tuner to provide a good match for the transmitter before turning the power up. NUMBER ONE PRIORITY IS TO PUT SOMETHING UP AND GET ON THE RADIO!!!! EVERY SO CALLED ANTENNA WORKS!! !